David Coulthard seems to have learned an important lesson this season and, as he demonstrated again at the Brazilian Grand Prix, has stayed out of trouble trying to maximise the performance of a car which, right now, is not the best of the field, maybe not even the second best. In the three rounds of the 2001 championship, the Scot has performed in a very Prost-like manner - unspectacular yet efficient - coming out from nowhere to pick up the pieces when his rivals failed or were struck by bad luck. This was all the more evident during last Sunday's Brazilian Grand Prix. Coulthard managed to avoid trouble during an incident-packed race and eventually saw how his rivals dropped one by one, allowing him to emerge in the lead, courtesy of a wet setup gamble which gave him the edge over Michael Schumacher when another torrential rain hit a Formula One race. Luck too was on Coulthard's side last weekend, as he himself and his McLaren team were once again on the losing end when it came to race strategy. As has been the case so often in the past few years when the race situation changed so suddenly courtesy of the weather, McLaren got it wrong and their driver struggled on the flooded track during an extra lap which could have cost them dear had it not been for the errors of Michael Schumacher. The Ferrari driver was far from his best at Interlagos during the race, and not only was he passed for the lead twice by two different drivers, but he also made two uncommon errors which should have seen him drop down the order but for the lack of opposition behind him. However, the current World Champion can consider himself lucky after leaving Brazil with a six-point advantage over Coulthard in the standings, as he was able to survive once more a spin and an off-track excursion, something Schumacher has been renowned for. Unlike their teammates, both Mika Hakkinen and Rubens Barrichello didn't have Lady Luck on their side. The Finn's race lasted one second - the one he needed to stall his car at the start, leaving him with only one point after three races, and what's probably worse for his title options - 19 behind Coulthard. 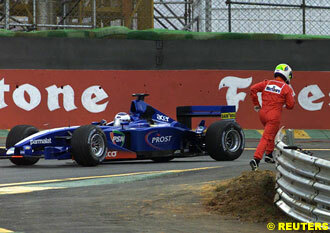 Meanwhile, Barrichello could not have had more problems during the weekend even if he had tried. At his home race, the Ferrari driver struggled in qualifying, had to take the spare car for the race, and ended his day's work crashing into Ralf Schumacher, again. Moral victories are hardly ever satisfying and they don't count for the championship race, but if there was a driver who deserved the win last Sunday, that was Juan Pablo Montoya. Some performances clearly show that a new star is born. It was the case at the Monaco Grand Prix in 1984 when Ayrton Senna almost took his first win driving an underpowered Toleman, and again when Michael Schumacher qualified his Jordan in seventh place in only his first ever Formula One race. Montoya's performance last Sunday will probably be remembered as the race where a new star was born, and Formula One needs that badly. In only his third race, the Colombian driver not only completed a spectacular pass over Schumacher - from so far back that the German wasn't even expecting it - but also lead half the race in commanding fashion, until Jos Verstappen inexplicably crashed into the back of his car as he was lapping him. It was refreshing to see a new driver challenging for victory, and even McLaren or Ferrari fans must be happy to welcome the Williams at the top of the field. Fighting for pole position in two consecutive races is no fluke, and it would definitely be interesting to see where Montoya or Ralf Schumacher would be in the Championship if they hadn't been so unlucky in these first three rounds. Montoya's race shouldn't overshadow his teammate performance, however, for Ralf is driving better than ever. Ironically, the German has been the innocent victim of another driver in all races this season. 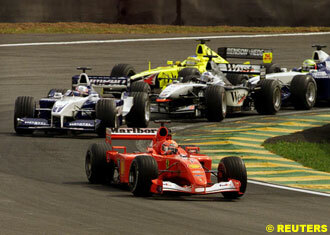 It was Jacques Villeneuve in Australia and Barrichello twice in Malaysia and again in Brazil. The Brazilian driver, unlike Verstappen, was not fined by the race stewards however, again highlighting the FIA's irregular methods for applying those unwritten rules which cause so much controversy. The Schumacher brothers wrote another chapter of their personal story in Formula One at the Brazilian Grand Prix, by achieving what Rubens Barrichello had stopped them from doing two weeks earlier in Malaysia: completing an all Schumacher front row. After six pole positions in a row, it was no news that the elder of the two Schumachers stretched his streak to seven, anticipating what the odds said would be his seventh consecutive victory, and although the German looked in control during most of the session, his younger brother Ralf fought until the final minute to put his Williams on pole. The qualifying session at Interlagos confirmed something that was already hinted at Sepang: the BMW-Williams team, on Michelin tyres, are back on top and though it is still too early to predict if they will be able to fight for every race win this year, it was pretty clear to see that if Michelin keeps providing the same quality rubber during the European season, the British team will upset the established order more often than was expected few months ago. Having topped the time sheets during the final practice session with the fastest time so far, Juan Pablo Montoya began to give evidence of what was to come on race day. The Colombian, driving flat out from his first qualifying run, was forced to take the spare car after spinning off the track on his first attempt seventeen minutes into the session. Michael Schumacher came out of the pits for the first time after 20 minutes, displacing local hero Rubens Barrichello, who eight minutes earlier had been the first top contender to jump onto the track. The Brazilian, however, was not comfortable at the wheel of the Ferrari, complaining of understeering. The McLaren drivers were not much happier with their cars, and Mika Hakkinen's first attempt was only good enough for fifth place, while David Coulthard saw his initial run spoiled by the yellow flags from Montoya's accident. Ralf Schumacher set the second quickest time less than two tenths slower than his brother, already showing his intentions and the Williams's speed. After having jogged back to the pits under the intense Brazilian sun, Montoya began his second attempt and immediately moved up to an impressive fourth spot despite not being completely satisfied with the handling of the T-car. While both Ferrari drivers aborted their second attempt, Hakkinen's was good enough to elevate himself to the front row of the grid, only 0.088 seconds behind Schumacher. It was obvious that, though the MP4-16 was not a match for the red F2001, the car handling had improved significantly compared to Malaysia. Coulthard, however, was only able to move up to fourth place. It was not until there were sixteen minutes remaining in the session that Michael Schumacher improved over his previous time, lapping for the first time into the one minute thirteen seconds bracket, something that only Montoya had been able to do during practice. Shortly after Schumacher had set his time, Montoya crossed the line on his third run and moved up to third place, right behind Hakkinen. Only seconds later, the Finn saw an impressive Ralf Schumacher demote him to the second row, still three tenths behind his brother. Meanwhile, Barrichello was still struggling with his car, unable to improve on his sixth position on his last two attempts. "I am very disappointed with the outcome of this qualifying session," said the Brazilian. "I was never able to find the ideal balance on the car, which was continually understeering. I am not at all happy, as I felt I could have got a much better result. Sixth place was certainly not what I was expecting here in front of my home crowd." None of the top runners were able to improve their times on their final attempt, and the Schumacher sibling became the first brothers to complete a front row in the history of Formula One. "It will be great to see my little brother next to me on the grid tomorrow and maybe we better get used to it," said Schumacher Senior, who is only one pole away from Ayrton Senna's record of eight consecutive starts from the top spot. "I think once again my parents' heartbeat will be very high at the start and the first corner. We know one another well enough and so we will not crash. It will be a hard but fair fight as we both have separate interests." "I think it will be very competitive in the race," said Ralf. "But I'm looking forward to it. Michael and I always fight fairly but fiercely. The car is very fast on the straight line and this shows that the Michelin tyres can't be that bad, but we'll have to wait and see how they perform in the race." 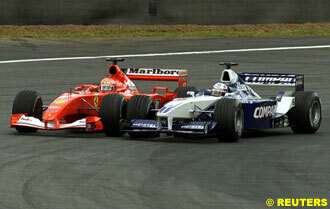 Hakkinen had to settle for third, with Montoya alongside him on the second row. Coulthard and Barrichello were disappointed with the third row, though the small gap between the top eight drivers - less than a second - meant the Scot was optimistic for the race. "The balance of the car has improved and there has been a performance increase from the engine as well," said Coulthard. "The competition is very close and I'm looking forward to the race where we should be in good shape." Further back, the Jordan team emerged as the best of the rest, with Jarno Trulli and Heinz-Harald Frentzen sharing the fourth row in front of the surprising Saubers of Nick Heidfeld and Kimi Raikkonen, who continue to impress at the wheel of the Ferrari-powered car. Although the weather was hot and dry on race day, beckoning clouds were a cause of concern for the teams, especially at Interlagos, where the situation can change so suddenly. Even before the start of the race, it began to rain over Rubens Barrichello, whose car broke down during the recognition laps, continuing with his unfortunate weekend. The Brazilian was forced to run back to the pits while the Ferrari crew worked frantically in order to get the spare car ready before the pitlane closed. 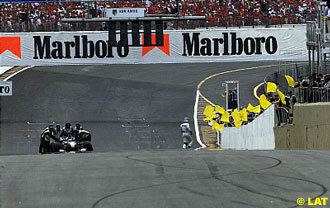 The action was worth watching, and eventually Barrichello was able to leave the pitlane 25 second before it closed. "The car was almost perfect and I am grateful to the whole team for giving me the chance to start my home race," said Barrichello after the race. "They really worked miracles and I am proud of them." After a poor qualifying session, Eddie Irvine endured yet another misfortune on the grid. His mechanics were unable to fire up his car before the 15-second mark, and the Jaguar driver was later penalised with a ten-second stop and go. The race got cleanly under way, for everyone except for Mika Hakkinen, who stalled his McLaren and lived one of the most frightening moments of his career. Fortunately, the rest of the field was able to avoid his car. However, the Finn forgot to replace the steering wheel and the marshals had a tough time removing the car from the main straight, which caused the safety car to be deployed for the third time in three races. While Michael Schumacher was the leader, his brother Ralf didn't make a good getaway and dropped to fifth behind Jarno Trulli. There was a Williams in second place nonetheless - that of Juan Pablo Montoya, who was running in front of David Coulthard. When the safety car came in on lap two, Montoya demonstrated that his reputation of being amazing on cold tyres was not a fluke, and from very far back, the Colombian dived on the inside of Schumacher, outbraking him, forcing him wide, and emerging in the lead on his third ever Grand Prix. The move was allthemore thrilling, considering that the German driver hadn't been challenged for the lead by a car other than a McLaren in a very long time. Seeing the blue and white Williams in front was refreshing for every racing fan. On the run down the second straight, Rubens Barrichello, who hadn't started very well, ran under braking into the back of Ralf's Williams. It was the second time in two races that the two drivers had clashed, and it was three out of three for the Brazilian, who had also pushed Heinz-Harald Frentzen off the track in Australia. "Obviously this has to be sorted out by the stewards and I hope they will take action as this has to stop in my opinion," said Ralf, who along with Barrichello received a warning by the stewards after the race. The German was able to come into the pits and get his car repaired, but when he rejoined the race he was four laps behind. 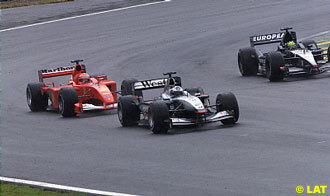 The order in front remained unchanged for several laps, while further back Olivier Panis began charging towards the front, overtaking the Prost of Jean Alesi to move up to ninth place, then Kimi Raikkonen for eighth, and Nick Heidfeld to take seventh. The Frenchman moved up to sixth when his teammate Jacques Villeneuve came into the pits to replace his tyres on lap 12. The Canadian's differential broke during the race, so he struggled to stay on track. Up in front, Montoya looked like a solid leader, setting a few fastest laps and even opening a small gap over Schumacher, who never seemed capable of getting close enough to try anything, in part courtesy of the amazing straight line speed of the BMW-powered Williams. On lap 15, Panis gained another place as he passed Jordan's Frentzen, quickly setting his sights on fourth-placed Trulli, who was very far behind the three leaders. Five laps later, Panis passed the Italian, continuing his trouble-free charge. Unable to pass Montoya, Schumacher decided to come into the pits for the first time on lap 25, dropping back to fifth place. Panis pitted three laps later, allowing Schumacher to take third place after having passed Trulli. Despite a clear track ahead, the Ferrari driver was not capable of lapping significantly quicker than Montoya, who was slightly getting away from Coulthard. When rain began threatening on lap 37, Montoya's lead over the McLaren driver was 5.2 seconds, already having led more than half the race. 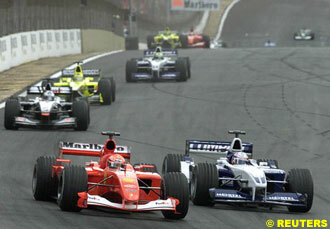 On lap 39, though, the Colombian lapped the Arrows of Jos Verstappen at the end of the second straight. Inexplicably, the Dutchman tucked right behind the Williams, and when Montoya braked, the Arrows crashed right into his back. "I am disappointed, of course, as it was going to be one of the best days of my life and it turned unluckily into a bad one," said a philosophical Montoya. "Better things will come." Indeed, they will. It was surprising to witness the coolness of the Colombian after climbing out of his car, immediately waving to the crowd despite the disappointment. Coulthard, who was now in the lead, pitted on lap 40, rejoining right in front of Schumacher, as the rain began to intensify. Moments later, heavens opened and the track was quickly flooded. Most of the cars came into the pits, and teams like Jordan or BAR saw how both their drivers pitted at the same time. Panis came off worst, and when he had finally left the pitlane, he was back in ninth place. Schumacher pitted on lap 46 as Coulthard decided to stay on track, something that in normal circumstances would have cost him the race. The track was very wet, and the McLaren driver could hardly step off the throttle out of the corners. Of course, when he came in to switch to intermediates - just like most of the field - a lap later, he rejoined the race miles behind Schumacher. Frentzen was third almost a minute behind the leaders, while Heidfeld had moved up to a sensational fourth, Trulli fifth and Raikkonen sixth. Things looked very promising for Schumacher until lap 48, when he made an uncommon error and spun. Luckily for him, he was able to stay on track and continue in the lead. However, the spin meant that Coulthard was now right behind his rear wing. The Scot, who had gambled to start the race with a wet setup, was clearly faster than the Ferrari and on lap 50 dived on the inside of Schumacher at the end of the straight, just when both were lapping the Minardi of Tarso Marques. 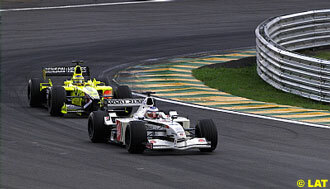 The Brazilian stayed on the middle of the track, allowing Coulthard to take the inside line while Schumacher drove around the outside. Coulthard quickly began to pull away from the German, who lost his car again on lap 53, this time running off the track, again being able to rejoin. Further back, Panis was charging again, taking sixth place away from Alesi, while Heidfeld moved up to fourth after passing Trulli, who was struggling with his car. All of them would move up a place when Frentzen was forced to retire with an electrical problem, promoting Alesi to sixth, though the Frenchman was under pressure from Giancarlo Fisichella. The Italian would pass the Prost on lap 65, as would Jacques Villeneuve on the next couple of laps. Two laps later Panis overtook Trulli once again to take fourth, a result which didn't go in accordance with the Frenchman's performance but that at least allowed BAR to earn their first points in 2001 and, most importantly, to finish ahead of their main rivals of Jordan. Coulthard was able to cruise home while Schumacher was finally able to get to grips with his car. The gap, however, was never less than fifteen seconds. "It is the best feeling I have ever had after winning a Grand Prix, it is a great feeling, a really special one for me," admitted Coulthard. "I had almost forgotten what it feels like to win." 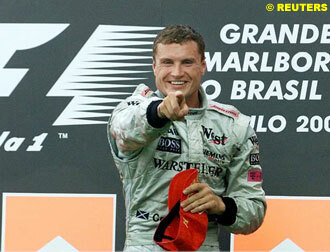 That's little wonder, as no other driver but Schumacher had won a race in the last seven months. "I was on a two stop strategy and I was hoping for rain, because with David in front of me, I thought that would be my best chance," confessed Schumacher. "But today, it did not work out for us. The car was not working quite the way I liked it, which is why I had a couple of 'offs', which is not normal for me in these conditions." Heidfeld finished third, giving the Sauber team their first podium since Spa 1998. "I really cannot quite believe this result," said a happy Heidfeld. "We started the race with a normal dry-road set-up, and everything went well. To visit the podium for the first time is incredible for me. I'm so happy for the team. We have really worked for this result. And for me it is just amazing! It's a lot more fun this year to be in the points, especially to finish on the podium." After his great performance, Panis was fourth, and he could have been easily third had it not been for his pitstop blunder. 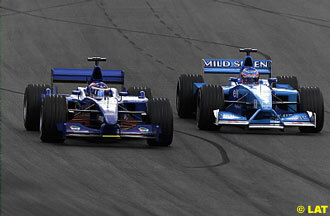 Trulli could eventually hold on to fifth spot, while Fisichella took the final point for the struggling Benetton team. The 666th Grand Prix of the modern era marked the end of Michael Schumacher's winning streak, but also the beginning of the European season. Hopefully, as Williams showed, it also meant the end of the Ferrari-McLaren duopoly - something the fans want and Formula One needs. The remainder of the season, then, looks very promising indeed. 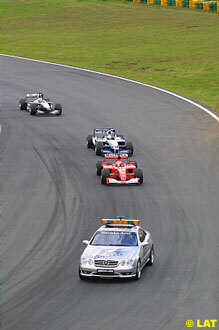 German Schumacher was forced into second on lap three by Williams' Juan Pablo Montoya, but regained the lead when the Colombian crashed out. He struggled in the rain and was passed by David Coulthard on lap 50. 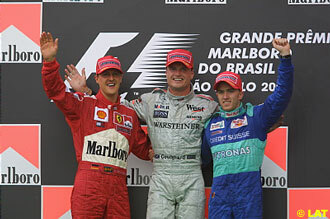 It was Schumacher's first defeat in seven races. 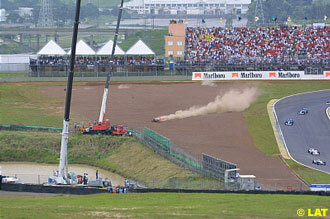 Brazilian Barrichello's home race ended in the gravel after just two laps when he missed his braking point and went into the back of Ralf Schumacher. He had only just made the start after his race car broke down 35 minutes before the race. He started in the spare car. 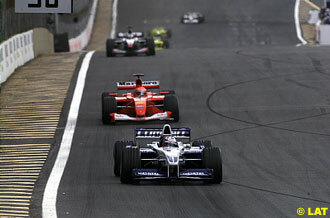 Briton Coulthard moved up to third at the start and stayed close to the lead battle, moving in front when Michael Schumacher pitted and Juan Pablo Montoya crashed out. He lost the lead when he was late into the pits as the rain got heavier, but regained first place with a move on Schumacher into turn one on lap 50 and went on to win. 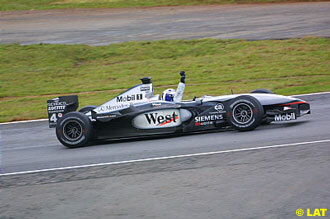 Finn Hakkinen stalled his McLaren on the line and was fortunate to be missed by the rest of the field before stepping out of the car to retire. Colombian Montoya made a stunning move on Michael Schumacher into the first corner at the start of lap three to take the lead but was hit by back-marker Jos Verstappen in turn four to end his race. German Ralf Schumacher dropped from second to fifth off the line and was hit in the rear by Rubens Barrichello's Ferrari to send him into the pits for a long repair which put him well out of the running, and he crashed out with 54 laps completed. Italian Fisichella started 20th, but capitalised on his reliable car to slowly move through the field and score Benetton's first points of the season in sixth. Briton Button struggled to improve from 20th place on the grid and lost time in a long pit stop on lap 30, finishing well down on the leaders in 10th. Frenchman Panis drove well early on and moved up the field to claim an eventual fourth place finish to score his first points for BAR. Canadian Villeneuve made an early pit stop and ran off the pace to finish just out of the points in seventh, one lap down on the leaders. Italian Trulli ran fourth for much of the race, but was passed by Panis with four laps remaining and ended the race with two points in fifth place. German Frentzen moved through the field to claim third place, but his hopes were ruined by mechanical failure to leave him classified 11th and last. Dutchman Verstappen drove steadily until he crashed into the back of leader Juan Pablo Montoya on lap 39 to end both their races. Brazilian Bernoldi started from his best-ever grid position, but retired on lap 16 as his disappointing season continued. German Heidfeld overcame a slow stop when a fuel nozzle became stuck to rise up the field and claim a podium position in third. Finn Raikkonen ran in a lower top-10 position all race until he was caught out by the rain and spun out on lap 57. Briton Irvine's race was ruined by a 10-second stop-go penalty after his mechanics were slow off the grid. Two spins in wet conditions ended his race when the Jaguar became lodged on a kerb. Brazilian Burti ran an uneventful home race which disappointingly ended after 30 laps as he was forced to retire with a mechanical problem. Brazilian Marques started last on the grid and ran at the back of the field to finish three laps down in ninth. Spaniard Alonso started 19th but failed to move up the field and retired on lap 27 with a mechanical problem. 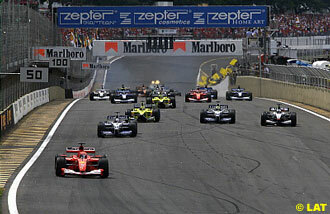 Frenchman Alesi moved slowly up the field and claimed eighth position after an uneventful race. Argentine Mazzacane had a terrible time in the wet and ended his race on an escape road after an engine blow-out.